The goal was simple: to make sure Camp Pendleton would remain fully functional if the electric grid went down. The result was extraordinary: a fractal microgrid. Jim Young, of Realcomm, explains more about the California-based project. 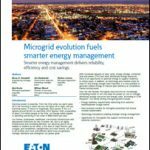 Microgrids have been on our radar at RealComm for several years now. We knew there was a viable relationship between microgrids and smart buildings & campuses. After all, why wouldn’t forward-thinking companies want to take advantage of all the benefits of a microgrid for their commercial and corporate real estate projects? Brand new technologies often start out as a trend, the ‘next new thing’. There was speculation that the energy around microgrids was coming from a large influx of capital from state and local governments, as well as the utilities. Like many new ideas, microgrids rose in popularity and then suddenly disappeared. After the hype phase died down, the topic of microgrids did not disappear, but rather the noise went away and the serious got down to work. One aspect that seemed ambiguous was defining what microgrids actually are; there are many different names and interpretations. Are they simply local co-generation systems, or a radical augmentation? In extreme cases, could they replace the current electric grid operated by the utilities? There is a definite need for microgrids and they have a unique relationship with smart buildings if we really want to achieve the ultimate efficiency for the built environment. Early this year, we were invited to tour the FractalGrid Demonstration project at Camp Pendleton. A very advanced project conceived over ten years ago, this project was completed in partnership with the private sector and the Navy. The goal was simple: to make sure Camp Pendleton would remain fully functional in the event of a utility grid interruption. The result was extraordinary, with multiple microgrids strategically arranged to follow a fractal or recursive pattern. Concentrated and PV solar, combined with an advanced flywheel storage system, utilization a state-of-the-art enterprise management platform based on the Intercontinental Ballistic Missile System ICBM (needed for almost instantaneous response), all tightly integrated into smart building automation systems. The result was possibly the most advanced microgrid/smart building project in the world, which generated 140 percent of the required electricity for the project. Following is the executive overview of the project. The Camp Pendleton FractalGrid Demonstration (CPFD) Project provides uninterrupted power to loads within a subset of the 52 Area boundary. Upon demand, FractalGrid units are able to island themselves from parent grids, including the utility grid, without any disruption to the facility or adjacent communications and civil infrastructure services and subsequently grid-connect when needed. Utilizing innovative advanced energy storage that can handle up to six full charge/discharge cycles a day for up to 50,000 cycles (with a 25 yr. minimum warranty), essential loads are supported for a set minimum number of days utilizing renewable resources and traditional backup power systems. Critical loads remain on individual circuits with all other building loads sheddable via automation and user interaction (if required). Utility interoperability will be fully integrated, enabling local utilities to take advantage of local microgrids for demand management events as well as to call upon their excess energy to support other needs within the larger outside service area. The system optimizes energy, eliminates utility costs, provides uninterruptable power, and integrates renewable and legacy assets. Parking Garage microgrid is comprised of a single 120kWh advanced energy storage unit. P1069 Server/Communications Room Microgrid is roughly in the 2kW size and includes generation via solar panels and storage via batteries. P1069 Building Microgrid utilizes over 500kW of renewable generation, 120kWh of advanced energy storage, 200kW of traditional backup power, and enhanced load shedding via a sophisticated C4I energy management platform (flex Power System™). Area 52 Microgrid – An innovative aggregation of all the other microgrids plus an additional 600kWh (future) of energy storage and grid interoperability (OpenADR2.0B) to the flex Power System™ platform. This project, and many other world-class next generation smart building case studies, will be presented at IBcon on June 8-10 in San Antonio, Texas. Jim Young is co-founder & CEO of Realcomm.